We released a privacy and security settings list for the Firefox web browser back in August 2015. That list, created by Ghacks reader Pants, has been updated regularly since then. The newest version of it, featuring hundreds of advanced preferences for Firefox, has been released today. The latest version of the preferences list contains 298 different preferences for Firefox, and it is growing with every release. With the release come fundamental changes to the layout of the list, how it is made available, and its format among other things. You can click on the link at the top to visit the updated article that lists download options and each entry in article format directly on the site, or, and that is a first, use the newly created HTML versions instead which offer better formatting altogether. Pants has created a light and dark version, and both are included in the archive that you can download so that you can access both HTML documents locally on your system. Quite a bit of rewording on prefs to read better. I also added in or replaced existing links on quite a few prefs as well. An HTML version is provided. It's color coded, for example all "warning:" 's are red (the word not the actual warning itself), the section headers stand out, and so on. You'll see. Also links are all hyper-linked to open in a new tab. Revamped the intro section at the top to make more sense and to highlight important information better such as the need to make a backup before you apply changes or go through them to make sure you don't run into any inconveniences or issues. LATIN defaults. The web doesn't really uglify that much without DL'ed fonts. You get used to it. + added 2431 disable push notifications (was previously 2420 with one pref, now has five prefs) just on a side note: I'm not sure if push has security or privacy issues (well, privacy yes due to the fact apps can notify even when the app is not loaded or focused), but for now it seems like bloat. It's also more in line with the keeping FF quiet mantra. 0309+0310 two plugin prefs: are supposed to be deprecated in FF43, but they wont delete. My thanks go out to Pants who put an incredible amount of work into creating the list and maintaining it. Without him, the list would not exist. Please provide feedback on the update, the new format, the HTML versions of the list, preferences, and anything else you can think of that help us make the list even better than it is right now. 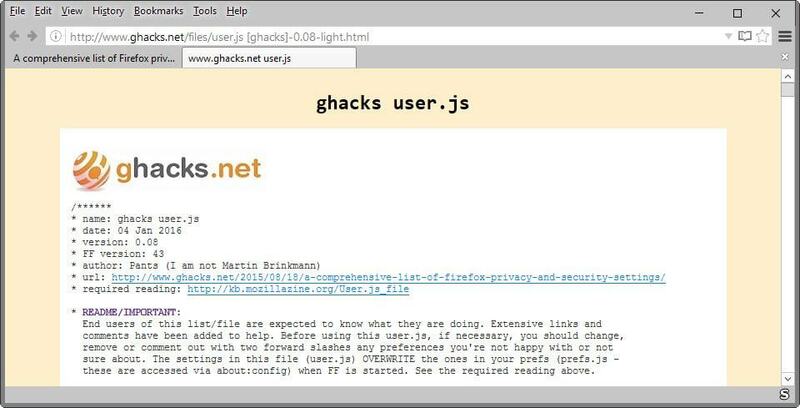 We have released an update for the Ghacks user.js listing for Firefox that lists hundreds of security and privacy settings for the browser. One of the biggest points of the changes is that is the paragraph in red under common issues. These are my settings and they’re rather tight and will cause site breakage (I’m not really interested in maintaining two versions) – but to compensate every contentious setting has a red warning, and is also indexed under common issues. End users should know how to comment out or change setting and how to reset to default in about:config. Enjoy. I also keep an eye on the original url, so keep suggestions coming in. Great work, Pants. Moreover updating this list (as old settings are deprecated and new ones, mainly tied to updated FF versions, arise) makes it even more valuable, reliable. A lot of work contributing to what most of us aim for, a browser tailored to our own preferences, in terms of privacy and of security. A user.js file has never been so extensively taken care of, to my knowledge. Much appreciated. Of course, many thanks as well to Martin for hosting the project. What is the difference between “security & tracking protection” and privacy. I assume “S&T” protects against what is coming in and “Privacy” is about what goes out. Is it not possible to have both? This is too hard and messy to explain. Between security + privacy there will be overlap. Eg implementing HTTPS increases privacy by using end to end encryption, this cutting out the middle man snooping. But it’s primary objective is securing your connection so you can’t be spoofed – that it when you go to https google, you know its google. Tracking can be allowed (eg cookies for gmail) but may start to invade your privacy (allowing XSS google cookies on other sites) – but remember that gmail is an opt-in service. Downloading up to date safebrowsing files and allowing safebrowsing will increase your security (from malicious sites, downloads etc). Every time you visit a website or download a file, FF will consult the safebrowsing lists stored locally on your PC – if the item is not listed, then a third party (google in this case) is contacted to make sure you will be safe. This allows a third party, google, to amass data about you. Imagine how much stuff isn’t listed in those local files. You might as well just use google’s DNS servers. They already know your IP from your gmail activity (in this example we’ll assume you have some sort of google/gmail/g+/youtube etc account). This is an example of increasing security but decreasing privacy. Yup, I see the difference. It’s basically a balancing act. For something that is “too hard and messy to explain’ you did a pretty good job. Thanks Pants for your effort.Its appreciated very much. Thanks for your work and for sharing this valuable resource. can soneone please tell my where to place the user.js file and how to tell if its in fact running? Type about:support into the urlbar and hit enter. On the resulting page will be an item listed called “Profile Folder” with a “Show Folder” button next to it. Click the “Show Now” button and it will open your profile folder in Windows Explorer. One: In your profile folder, COPY your prefs.js file, and rename it as prefs.js.backup or just leave it as “prefs – Copy.js” <- this is important, because if you want to get back to how you were before the user.js, this must be done. The preferences that would affect you the most are the ones listed at the top of the file under "COMMON ISSUES". I suggest you locate those prefs in the file and comment them out or you will drive yourself mad. The file as is, has plugins blocked, fonts blocked, clipboard disabled and so on. So make changes first in the user.js file. Three: rename the file to just user.js (don;t leave it as user.js [ghacks]-0.08.js) – it needs to be named "user.js". Copy that to your profile folder, the same one you have the pref.js and the prefs.js copy you made. Close FF. Restart FF. When FF starts, it reads all active preferences in the user.js, and loads them into prefs.js. And it is in prefs.js that FF stores all your custom settings. IF you need to go back to how you were, because it's all just too hard, or you don't like it, then FIRST of all, and this is important – RENAME the user.js to user.js.old or something so FF doesn't use it again. Then close FF. FF must be closed. Then delete the prefs.js and rename your copy back to prefs.js, and then restart FF. It's not that complicated to backup prefs.js, to comment out preferences in user.js, to put the user.js in your profile and use it. Its not hard to revert back if you hate it or whatever. hello Martin, where are you? Firefox offers end-users a remarkable degree of local control. 1. How often does Mozilla expand/reduce/modify these options? 2. How many other web browsers offer this level of local user control? 1. Everytime an update is done. 2. Palemoon, K-meleon, Seamonkey and other mozilla-chrome related browsers. This listing is quite comprehensive and can be a bit overwhelming the first time someone looks at it, but I’ve found that using a diff-tool such as Beyond Compare, Meld, or WinMerge helps tremendously in getting updated versions of the listing in place, and working. Thank you for the update, Pants, and thanks to you for hosting it, Martin! That’s what I do to create the changelog. When I’m ready to give Martin a new version, I simply compare the previous version hosted on ghacks to the new one (I use Araxis Merge, but any compare tool will do). I normally work from https://github.com/pyllyukko/user.js to build my own user.js. When time permits I’ll diff this one and see what’s different. Pants, is this list maintained in the open (github or the like) or are you exclusivly releasing through ghacks? Just here. That way I have no responsibilities. You’ll find pyllyukko has 200 prefs, 45? of which are ciphers, half? of those are deprecated. And they include a few settings that are at default (eg tls.version.max). That’s all good, as they want backward compatibility and are covering all the bases. The ghacks user.js on the other hand, if we exclude anything not relevant (deprecated, personal section 3000, and to be investigated), comes in at 285. Yup. 285. I wish we didn’t have that many, and some of it is overkill (eg removing urls – which I call future-proofing). And a lot of things I left out (eg cookies, I only set one pref and then recommended an extension for a per domain control: eg referers, I set two prefs and then recommended an extension for a per domain control: eg I included nothing about passwords because that is all available from the UI) and so on. I could easily add more. I think you’ll find the two are vastly different. I don’t get it. What is a .js file (and don’t send me to the MozillaZine b/c I still don’t get it). If I click on user.js-ghacks-0.08.zip are the changes made? Or do you have to do something else? Jim, changes are only made if you place the js file in the Firefox profile directory. You should not do that however as it is recommended to a) backup everything before you even start and b) go through the listing and only use those preferences you feel comfortable with. You can easily comment out preferences or entire sections. Another option is to make the changes on about:config instead which is a good option as you can reset them there when the need arises. This is great work, any way to impliment this with configfox?. First of all, this is my opinion. I have no qualms about ConfigFox or the developer. People can develop what they want, and use what they want (and anything I provide, take what you want, sans credit, I don’t care). This is just my opinion (you don’t have to like it, but I have one). Not really. I personally have issues with ConfigFox. For starters it will not work with portable Firefox. So until that is fixed I’m not touching it. Secondly, I do not like how ConfigFox, by default, edits the prefs.js directly, and treats commented out prefs in user.js as an instruction to remove them from prefs.js. In any sane world commented out code is ignored. However, Leandro added an option to disable this (editing the prefs.js directly) but calls it “paranoia” mode – which is meaningless. There is also no clear description of the difference and problems between the two modes. Because of the default mode, the list provided is a dumbed down list – as the developer decided the “fix” was to remove all items from the list that are in the Firefox UI, so end users wouldn’t get confused. So it’s not even a comprehensive list anymore – which reduces the functionality of the user.js in being able to enforce settings on a startup and for migration purposes. Its not a fix at all, it just hides the symptoms. I also wanted ConfigFox to be able to display all the information and links better, as I beef that side of things up. I have gone to a lot of work to provide this, so until it is used/displayed better – I am not really interested. The whole thing is quite frankly a mess. I had intended originally to provide a ConfigFox compliant version, but it’s not going to happen. As far as I am concerned, CF is fundamentally broken and flawed. However, its not hard to make it Configfox compliant – just do a little editing and follow the rules for how ConfigFox parses the file. Thanks ever so much for your reply, help and contribution Pants. Have learned much from it. memory.free_dirty_pages – default is false, suggested is true. For whom may find this setting interesting. Unless you’re really desperate for memory, I don’t think this saves much. To be honest, it just sounds like making FF do more work – as fast as you close pages, you open them again. It’s like freeing up RAM and then instantly filling it back up. That’s what it’s there for. That’s my take anyway. The only overall cache/memory pref I’ve turned on is having the disk cache off (1. forensics and 2. killing writes on SSDs). Anything else is better left to FF to handle I think, otherwise it will probably impact performance – eg 1003, 1006. The only other thing I do is to clear my memory cache periodically (using an extension). I’ve set disk cache off as well and increased memory’s cache to 512000, best value on my system after having tested with less and more. Anyway… I’ll have to dig further on this memory.free_dirty_pages setting, even if I agree with you that unless proven, “better left to FF to handle”. Which setting would I need to change to stop the console warning “Use of getPreventDefault() is deprecated. Use defaultPrevented instead”? Nothing to do with user.js and firefox preferences. I suspect it has something to do with an extension or a particular website (or JS library) ? That’s a great list. Thanks. I’m using it in Cyberfox 44 instead of FF 44 and it seems to be compatible. …back to “true” because it was breaking the back function in Google Images. …and use the ‘Change Referer Button’ extension instead. I use uMatrix so 2401-2-3-4 are all REM’d out. (you know what I mean). …to allow Youtube to fullscreen. Last, in 2803-4 I turn Cookies and Session to True and only leave Passwords at False. If I close my browser I want everything gone except for non-sensitive passwords. Any sensitive passwords should be stored outside of the browser anyway in LastPass, or better yet, in KeePass. I am surprised though that there were no performance tweaks at all. I know it’s not security or privacy, but I really figured at least connections and pipelining would be set for optimal. Anyway, Thanks again for all the time, effort, and energy. The vast majority of all those performance tweaks are a load of crap. There are too many real world variables for there to be a one-suits-all magic solution. Some of the items are better handled by extensions. This is one reason I don’t add referrer settings to spoof or block or anything (1603 is commented out). I personally use RefControl with a default block, and whitelist a few to forge or allow. Same with cookies (yes I included block all in the settings under custom), I use Cookie Controller with a default block all and then fine tune some session, some 1st party only. Passwords saved, cleared on close (same with form data, history, search history etc) – I leave that up to the end users really – especially as a lot of it is directly available in the options interface. Although I am slowly adding more prefs in in order to build a more comprehensive list and to easily migrate settings to new setups, clients, forks. Speaking of forks, a setting certainly can’t hurt, even if it is legacy – eg quite a lot of these won’t made an iota of difference to PaleMoon, but a lot will :) I’m sure someone could check/remove anything that doesn’t exist in a vanilla PM and post it somewhere – like in the PM forums. Do you know what could be causing YouTube comments not to display (perpetual loading)? With all extensions disabled they still don’t load. Thank you. I’m not sure. I have actually relaxed my own version. I am so sick and tired of fighting the web (so I have other solutions which allow a per site control – so many settings in FF now are better handled by extensions on a more granular level). I believe your problem will be dom storage and cookies for youtube. I don’t have a youtube/google account, and I never even look at comments, but as soon as I allowed youtube cookies + dom (using cookie controller), comments loaded. Let me know if it worked. I then went to check on my about:addons page and that add-on wasn’t listed! I removed the loop@mozilla.org.xpi extension file from the folder and ‘Firefox Hello Beta 0.1′ has disappeared accordingly from my about:support Extensions’ list. No idea how, when this sneaky loop@mozilla.org.xpi extension got installed. I always install Firefox updates the clean way : uninstall running version then install new one (keeping of course my profile), which means this extension was included in Firefox 45 ‘features’ folder OR was installed afterwards but not by me. This ‘features’ folder is dated 15 mar 2016 when others have the Firefox install date of 8 mar 2016, but 15 mar 2016 23:25 is the time I removed the extension from that folder hence re-dating it obviously when restarting Firefox. I’d have to do a clean install again to confirm, but what is certain is that I have not installed that add-on and if I had it would appear in my profile, not in a Firefox’s install sub-folder. This is weird. Moreover because you haven’t this issue. It was installed by Firefox 45 itself. Sorry for being so personal but I cannot edit my past comments here. Anyone refusing Firefox’s Hello should read this. Hence we can leave it or delete this xpi file in its ‘features’ folder mentioned above, but not simply disable it as it is what they call a ‘system add-on” … unless it be with CCleaner! where this system add-on appears as all other add-ons in CCleaner -> Tools -> Browser plug-ins -> Firefox — This can be an interesting work-around even if, as you mention it, this particular system add-on can’t do harm on a Firefox where loop is disabled, but worth being noted I guess for future ‘system add-ons’ as long as Firefox won’t offer the option to disable them as it does now for regular add-ons. Have been using user.js [ghacks]-0.08.js on FF 47.0, Arch linux for a few weeks. prevents Add-ons page to load, if dnscrypt-proxy is enabled.